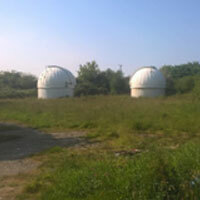 This is a really interesting historic landscape walk. Best described as moderate (mainly due to its length), as anyone who visits the main settlement area of Chacewater knows, it sits in a bit of a valley bottom and so all ways out are upwards to some degree! The trail basically takes you out of the village via Fore Street and Station Road (be careful of the traffic, because it can be busy at times!) then off up to the Terrace and onto North Hill, at which point you can turn round for the first of many stunning views of the surrounding area. Keep going to the very top of this by-way (PRoW 301/25/1), turn right and right again back down where you dart in behind Carley’s Organic Foods – a fine example of a small to medium sized modern business run on an almost zero carbon footprint. Emerging out onto Station Road, you head north (left) and left before the magnificent 7-arched Chacewater viaduct. Up the rise and keeping the old railway station to your right, you eventually turn left down a bridleway (PRoW 301/62/1) that leads out onto the awesome Great Wheal Busy Downs area. Just follow the bridleway left (noting the Old Cornwall Observatory buildings to the left – hopefully soon to be regenerated) and around in a loop so that you can take in the magnificent views south and westward (best seen as the day dawns or runs into dusk) of this World Heritage Site (WHS) mining scene, which is laid out before you in all its glory. Continue then to trek through a rugged landscape track of capped mine shafts and note the pool to the right before turning left, back and down into the main village settlement via the Terrace, Buckingham Nip and along our historic High and Fore Streets to the car park, where all sorts of refreshment options are available. You may even wish to take in a bit more bird life and the surrounding scenery up on the Millennium Village Green, taking note of the John Robarts V.C. memorial stone at its entrance. About 3 miles in all, this walk aims to provide you with a relatively short but very real insight into the topography of Chacewater Parish and just a glimpse of its heritage. 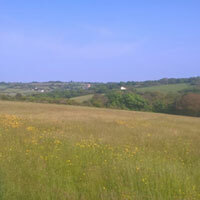 Picnic Areas – The nearby Chacewater Millennium Green before or after your walk, although some have been sighted sat on top of Great Wheal Busy Downs on occasion. Eating and Shopping – Along Fore Street you will find a couple of traditional village shops, the Old Market (Fruit, Veg, seasonal plants and Deli) for coffee, our local Bakery and Fish and Chip shop. Family and Children Friendly – a bit up and down and not really pram friendly, there are also a couple busy rural road stretches, but in the main this is a route of discovery for the whole family to enjoy. Cycle Trail – Yes, although the first half mile is a bit of a challenge. Horse Riding Trail – Recommended, but in parts only, due to number of metalled roads. 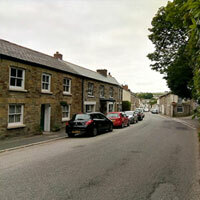 Walking Trail – Whilst described as moderate, the route is best undertaken with good boots. Disability Access – Certainly not recommended for scooters or those that have difficulty walking. 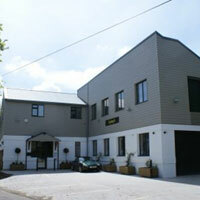 Fine example of a small to medium sized business premises of almost zero carbon footprint. 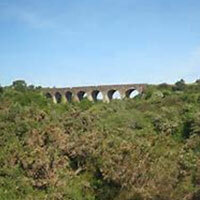 An iconic structure along the London to Penzance railway line. 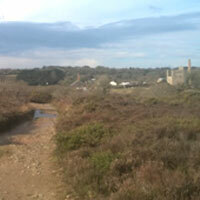 This shows the view across the valley bottom of the main settlement. “Gentrification” proceeded with the development of shops (many distinctive early/mid-19th century decorative shopfront windows survive) and houses on either side of the main thoroughfare with polite villas along the Terrace, overlooking the valley. John Betjeman noted “well-built colour washed cottages … bow-windowed Georgian shops … and up the valley slopes, the tidy villas built in the last century by mine captains.” (Chacewater the Story of a Mining Village (2nd Edition, 2002) Willem van der Eyken).